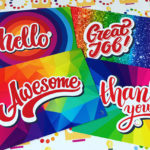 4 reasons why printed postcards are great for business! They are a great and cost effective way to promote your business, a lot of photographers use them. For just a small amount of money, you could get your business the attention it deserves! No other marketing vehicle offers this level of reach for such a small investment. The Postal Service suggests that postcards are more than six times as likely to be read as compared with direct mail letters – 94% versus 14%. They don’t have to be opened and you can add colours and graphics to quickly get your reader’s attention. Don’t you feel like you’re talking with someone when you read a postcard? A postcard allows you as a business owner to get close to your prospect and communicate in a friendly, social environment. With numerous options available to you regarding size and layout, you can design a card for virtually any purpose. Invitations, marketing messages, special sales, announcements, upcoming events, even mini-newsletters – all can effectively be accomplished with postcards.Try it for yourself. If you’d like to send some branded postcards, get in touch with us on 01332 418377. We offer ideas and cost effective ways to send them out. PreviousPrevious post:Their office has space hoppers!NextNext post:Nice people to do business with!